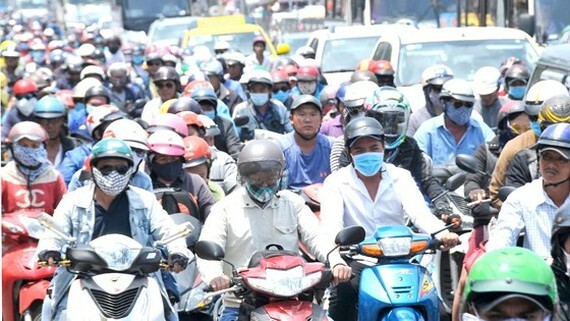 Ho Chi Minh City and Hanoi, two biggest cities of Vietnam, have been facing severe traffic jam and environmental pollution caused by exhaust fume. Lots of researches and programs have been drawn and expected to well control operation of private vehicles and create conditions for public transport development. Still experts have advised the cities to go step by step to obtain the target. According to Professor Dr. Nguyen Trong Hoa, former head of HCMC Institute for Development Studies, the cities should implement simple, obtainable and convincible solutions to curb operation of private vehicles. Of these, they should get residents into the habit of walking by making them understand walking benefits and create advantageous conditions for them to practice the habit by keeping pavements clear and planting more trees to create shades. In case residents understand the benefit of walking, they will advocate the city to rearrange business in pavements. Besides, many benefactors and enterprises will be willing to give the city financial assistance to repair pavements to better serve pedestrians, he added. HCMC now has over 1.5 million square meters of pavements with unequal quality. In some places, pavements are paved with granite while they are badly downgraded in other places. Pavement repair and upgrading do not require expensive materials but environmental friendly low cost ones such as terracotta tiles or zig zag tiles. Residents’ walking habit will create an extremely important initial basis for public transport system development. Planting trees to create shares will encourage residents to walk amid hot and muggy weather and reduce environmental pollution. Mr. Le Trung Tinh, former head of the Transport Division under the city Department of Transport and chairman of HCMC Interprovincial and Tourist Passenger Transport Association, said that the next step which the city should implement is to create priority lanes for buses although it is not easy amid the ongoing infrastructure overloading. If buses continue getting stuck in the flow of private vehicles as present, it will be unlikely to maintain buses’ operation at the current level. HCMC Cooperative Alliance, making up 40 percent of the city’s passenger transport output, said that ensuring the timetable of bus routes plays a significant role in luring passengers. For the last past, the passenger transport output through the alliance has drastically fallen because up to 80 percent of buses have been unable to operate on schedule. Ten years ago, HCMC used to arrange priority lanes for buses in three major roads. Of them, the operation efficiency of the route in Tran Hung Dao street from District 1 to District 5 was very high. More importantly, there was almost no traffic accident in these priority lanes. Still many households alongside the routes disagreed with the policy saying it was unsafe as buses traveled contrariwise. In the end, the city was forced to shut down the bus priority lane routes. So traffic reorganization towards giving priority to public transport means need the bravery of relevant sides. Mr. Hoang Minh Tri, former head of HCMC Institute for Development Studies (HIDS), said that construction and planning fields should jump on the bandwagon to gradually rearrange residential areas, form satellite urban areas with done technical and social infrastructure systems to remove people from the center to outskirt districts and areas alongside metro and Bus Rapid Transit routes. A plan should be set up to connect these residential areas with public transport system. Every year, each field should join forces to gradually control operation of private vehicles to materialize the policy of traffic jam and accident reduction and environment protection. Currently, the Department of Transport has assigned HCMC Public Transport Management Center to pilot priority lanes for buses in some major roads comprising Vo Thi Sau, Dien Bien Phu and Nguyen Van Troi. This solution requires relevant sides to carefully calculate and consider all possibilities and responsible people to show their stuff and patience in implementation. Learning experiences from Singapore and big cities in the world, HCMC has approved a consulting firm to study fee collection on automobiles in the center area of the city during rush hour. Still the project has been halted because of residents’ concerns and even objections.